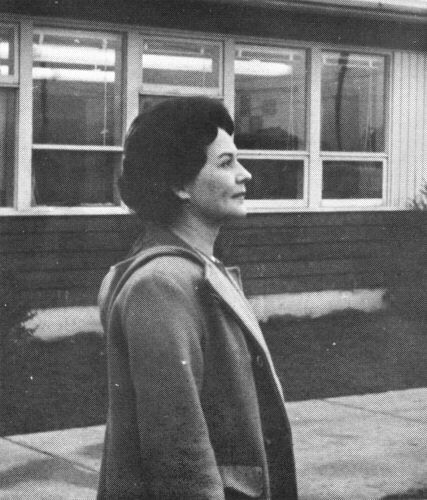 Miss Doreen Kendall, a practical nurse, and Mrs. Frieda Wilson, a registered nurse, are employed together on the night shift in the extended-care ward for elderly patients at the Cowichan District Hospital at Duncan on Vancouver Island. Theirs is a position that requires a special degree of tact, maturity and gentleness of manner for it is at night that their patients, often unable to sleep, have long lonely hours in which to contemplate the little that remains for them in life. A word or gesture of comfort from the nurses on duty is all they have in their fading world until the routine of morning helps them into another day. It is immediately apparent on meeting them that Miss Kendall and Mrs. Wilson, both in late middle-age, were assigned to their particular work with these qualifications in mind. 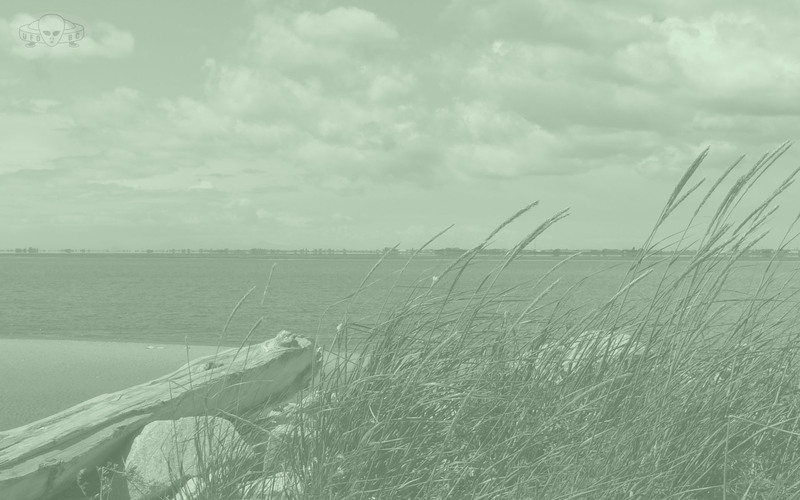 In addition to what training obviously has given them, they have an inborn quality that invites trust, and it was no surprise, after we interviewed them, that friends and former patients of each told us they would accept their word under any circumstance. Coming from several who had doubted the existence of UFOs, this was a significant tribute in light of what the two nurses (with partial confirmation by two others who arrived seconds later) said they observed outside the hospital just as 1970 was dawning on the Pacific Coast. It was turning five in the morning of Jan. 1 when Miss Kendall, concerned that one of her women patients was restless, switched on a light to attend to her. Deciding the patient was too warm, she went to a window near the bed and parted the drapes to let in a little fresh air. "Just as I pulled the drapes a brilliant light hit me in the eyes," she said. "It was still dark outside, but about 60 feet away right above the children's ward, there was this object so big and bright I could see everything clearly." "The object was circular and had what I guess you would call a top and bottom. The bottom was silvery, like metal, and was shaped like a bowl. There was a string of bright lights around it like a necklace. The top was a dome made of something like glass. It was lit up from inside and I could see right into it." Continuing her account in question-and-answer form, Miss Kendall said there were two male-Iike figures in the craft, one behind the other, facing to her right away from the hospital. The one in front appeared taller, or perhaps was positioned higher, than the other. Their heads were encased in close-fitting dark material. As she watched with intense curiosity, yet completely unfrightened - "I never felt so peaceful in all my life. I wish I could have talked to them " - she became aware of seeing more of the interior of the craft and realized it was tilting. In a moment she could see to a point just below their knees and noticed they were standing in front of what looked like stools. "They looked like fine, tall, well-built men," she said. "They were dressed in tight-fitting suits of the same material that covered their heads but their hands were bare and I noticed how human they looked. Their flesh seemed just like ours." Intrigued as she was by the appearance of the two figures, Miss Kendall found her interest mainly centered on what looked like an instrument panel facing the one in front. One reason for this, she thought, was that she comes from a family of racing-car enthusiasts and automotive mechanics have always held a special interest for her. "The man in front was staring at the panel as if something very important was going on, and I wondered if they might have had mechanical trouble," she said. "I even thought they might have landed on the roof of the hospital and then had trouble taking off. She described the panel as a very large one, taking up almost half the interior of the object and reaching nearly to the top of the dome. The instruments, if that is what they were, seemed to be inset in the chrome-Iike metal of the panel and there was a variety of sizes. The total sight was so absorbing that at first Miss Kendall's thoughts were lost to everything else, and for a moment she forgot Mrs. Wilson was in the same room. "Then when I did think of it, I guess I hesitated," she explained. "I felt I mustn't make a noise or do anything that would break the trend of what was happening." At this point, almost as if her thoughts were being read, she saw the figure in the rear turn slowly and face squarely in her direction. "He seemed to look right at me but I couldn't see his face. It was covered by a darkish material that looked softer than the rest of his suit. I'm sure he saw me because then he touched the other man on the back." Miss Kendall said that what followed, again possibly because of her interest in mechanics, made a sharper impression on her than anything else in the entire incident. "When the man in back did this, the one in front reached down and took hold of something like a lever beside him. I'll never forget how deliberately he did it. He pushed it back and forth and the saucer, or whatever you'd call it, started to circle slowly, still close to the building, in an anticlockwise direction." The motion seemed to break the spell for Miss Kendall, for then she remembered Mrs. Wilson was there and called her over. Later we spoke separately to Mrs. Wilson, who continued the story from that point. "I noticed Miss Kendall standing at the window and wondered what she was looking at. In fact, I was just going to see when she beckoned to me, and then I saw this great big light over the patio outside the children's ward. I'd say it was quite a bit larger than a car. (By the estimate of both witnesses, the object spanned a width of about five windows of the children's ward. This gave it a diameter of at least 50 feet.) It looked circular in shape and the far side seemed to be higher than the side near us. It was moving around slowly and then it started to move away. I didn't really see any top or bottom to it. It was all just tremendously bright. Some people say we were looking at a plastic bag with candles in it, put there as a joke. But it would take a million candles to make it as bright as that." Mrs. Wilson did not see the "necklace" of lights described by Miss Kendall, nor could she see inside the object and consequently saw no human-like figures. Since this appeared to be a serious difference in the two reports, we asked Miss Kendall in a second interview how she might account for it. "I think Mrs. Wilson must have come just a bit too late," she said. " After the thing circled four or five times, it started going away, farther along by the roof of the children's ward, and I couldn't see inside it either." Not being precisely sure how close the object was when Miss Kendall first observed it, Mrs. Wilson could not say whether or not this did explain her failure to see the occupants. But the fact that she came to the window in time to see the craft circling, and then saw it move away, suggests the explanation of distance does not quite fill the bill. So without intending to add anything to the narrative that the witnesses themselves did not observe, we offer another possible explanation merely for the sake of conjecture. It has been noticed in UFO sightings that the object when stationary gives out less light than when in motion. This rule, of course, is not invariable. UFOs emanating no light at all have been seen moving at high speed, while others glowing brightly have been seen to hover and even to land. 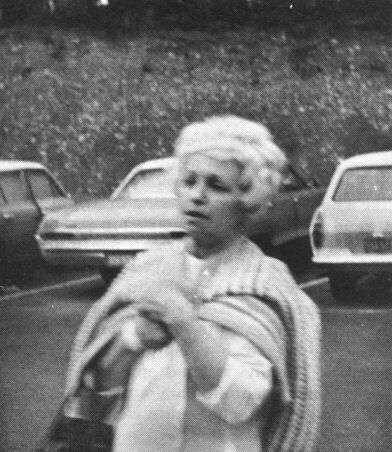 But the increase of light with motion does appear to be a general characteristic, and it is one that may have prevented Mrs. Wilson seeing the interior of the craft outside the hospital. All of Miss Kendall's observations in detail were made before the craft started to move. After that she, like Mrs. Wilson, was conscious only of the light and motion of the craft. In other words, by the time Mrs. Wilson reached the window the brightness of the object may have increased to an extent that all details were obscured. It would have been like staring at the headlights of a car. All one could have said about the car itself was that its lights were bright. This in turn may account for the fact that, unlike Miss Kendall, Mrs. Wilson felt only alarm when she looked at the object. Some maintain that at times through some kind of chemistry UFOs are able to exert a calming influence. But in this case it appears to have been the peaceful manner of the two occupants that dispelled any fear Miss Kendall might have felt. At this point two other nurses on the floor, Mrs. Clackson and Mrs. Appleby, hearing the excited comments of the first two, rushed to another window of the ward but could only see what they agreed was a "bright light" receding in the distance. Seconds later two other nurses also looked out a window but saw nothing. Apparently by that time the object had moved behind trees that border the hospital. 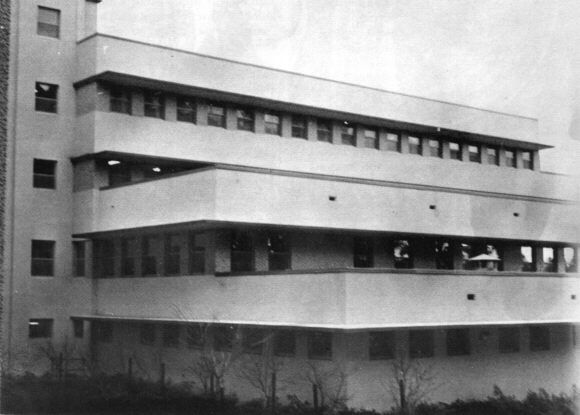 As nurses watched from window out of sight on left, UFO with two occupants was seen outside of children's ward on top story of this hospital wing. It spanned five windows, starting from left. A significant factor of this sighting is that none of the witnesses made any effort to publicize it, yet at the same time made no pretence of being secretive. Knowing of our interest in the subject, another nurse at the hospital who is a friend of ours phoned us a little later the same morning and it was through this connection that we arranged the interview which was later reported in the Victoria press. Immediately the story appeared, the two witnesses, like ourselves, started to receive phone calls by persons who were legitimately and intelligently interested and by others who professed to have exclusive private information about the incident. It was here that we acquired information of our own about people who, for some reason that escapes us, want to establish that they have the inside dope. We heard about half a dozen different versions of the incident being a put-up job. We were told by some it was a bunch of school kids having fun and by others it was a bunch of drunks. In two or three cases names were even mentioned but in no case did the names agree, and in no case did our callers explain how so much rowdyism was going on at the hospital grounds without the police being called. Also none of our callers mentioned another extraordinary sighting that occurred at Duncan within seconds of the hospital incident, obviously because this one was not reported in the press and therefore offered no one a chance to give us "exclusive" information about it. But the authenticity of the incident is undeniable because it was reported to authorities before the hospital case had received any publicity whatever. 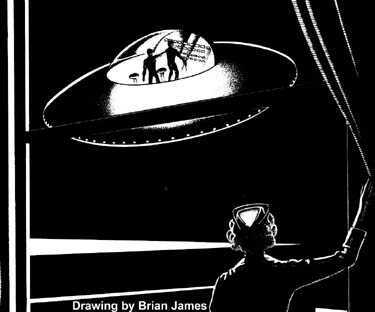 In other words, completely unknown to each other, two sets of witnesses were observing a UFO in the vicinity of Duncan early that New Year's morning. The second set of witnesses was a truck-driver and his wife whose names and report, like the nurses', are officially on record. Although admitting he had a few drinks, the husband said the experience made him feel cold sober and he was sufficiently affected by it to make his report though it meant disclosing his condition while driving. The man said he and his wife had just returned home from a party about five o'clock that morning when their attention was attracted by a huge white light "as big as a house" hovering low over their place. The witness described the light as somewhat oval or rectangular in shape (it will be noted the UFO at the hospital was circular but, if seen at an angle by these other two witnesses, it might have appeared oval) and said that three or four shafts of light extended down at an angle beneath it, converging to form a single shaft. This gave the object the appearance of a top. As they watched in amazement for a few seconds, the light suddenly shot up and either blinked out or disappeared in the distance at an incredible speed. "I may have had a few drinks," the man said, "but I know perfectly well that had nothing to do with what I saw, and my wife saw it, too." "At 5 a.m. I saw a flying saucer as low as the third floor of the hospital when I pulled the curtains. There were two men or figures in the dome flying towards Victoria. (Miss Kendall, who admits having an uncertain sense of direction, was wrong in this notation. Victoria lies south of Duncan whereas the direction taken by the UFO, as established by reconstruction of events, was northeast.) The bottom of the saucer was brilliantly lit and also the dome - New Year's morning." 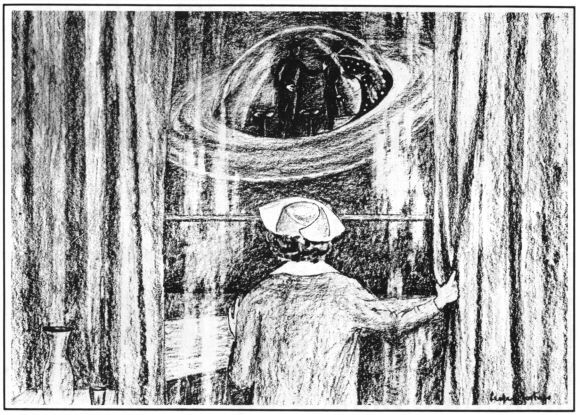 Of the two principal witnesses at the hospital, Mrs. Wilson was the more alarmed when she saw the UFO - in fact, as we have noted, the sighting had a peaceful effect on Miss Kendall - and later reported she had a "tingling" sensation which may have been caused by excitement or, as in some cases, by some emanation from the craft itself. Yet strangely it was Miss Kendall who was the more lastingly affected by the experience. 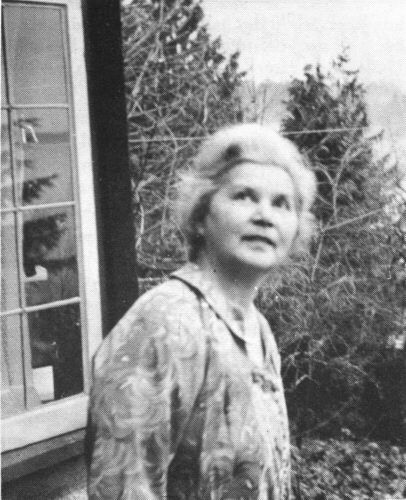 When she returned that morning to her home in Nanaimo, north of Duncan, her brother who was visiting from out of town immediately noticed something unusual had happened to her and asked her about it, whereupon she told him her strange experience. "For at least a week after that," she said in our second interview, "I didn't feel quite like my usual self. I think that normally I am an outgoing sort of person, but now I felt very subdued and some of the other nurses said I seemed preoccupied. By the time we saw her again, however, she seemed completely relaxed and friendly and though, by her own acknowledgment, she had been through an experience she would never forget, there was no sign that the incident would alter the composed tenor of her life in any way. One would have thought that was enough excitement for one day in the small town of Duncan but the strange aerial visitors decreed otherwise. About seven o'clock that evening the glowing craft - or perhaps another of about the same size - flew at low altitude through the darkness in full view of a flock of assorted witnesses at various points in the area. Since the morning visit was not yet publicly known, there can be no suggestion that people had started seeing things on that account. On this second visit the object appeared so big and bright that at least one group of witnesses could see it several miles away. 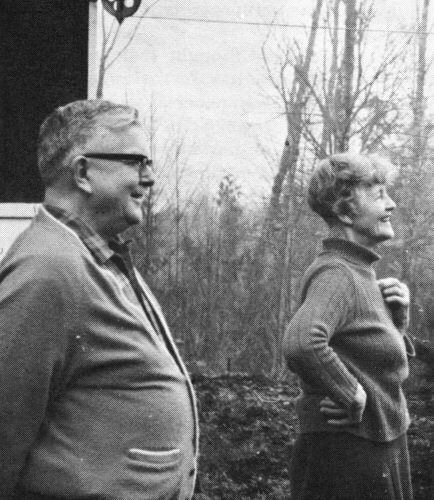 The observers in this case were Mr. and Mrs. Arthur Gillam and friends who were having dinner at the Deer Lodge restaurant just off the Island highway south of Mill Bay. To them the object seemed to be over the Saanich Peninsula, about 10 miles to the east, and was headed in a northeasterly direction. "All we could see was a large ball of light moving quite slowly, much slower than an airplane," Gillam said. "It must have been very bright for us to see it from that distance. I don't think a helicopter would have been that bright." Any thought that the object might have been a helicopter was removed by the comments of two other sets of witnesses who saw the light, or another of the same general description, much closer at hand. 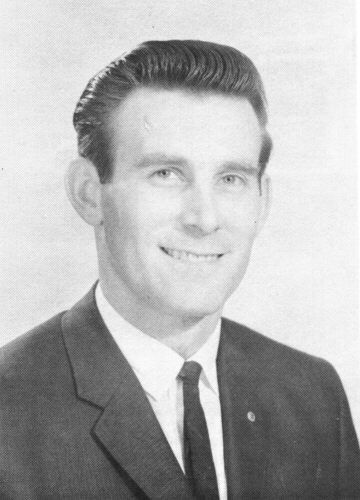 One of these groups was Judge George Hallett, his wife and three dinner guests who, at about 7 p.m. that New Year's Day, saw a huge orange-colored light passing slowly along the waterfront opposite the Halletts' home at Mill Bay. Reconstruction of the scene placed the distance of the light at about half a mile. 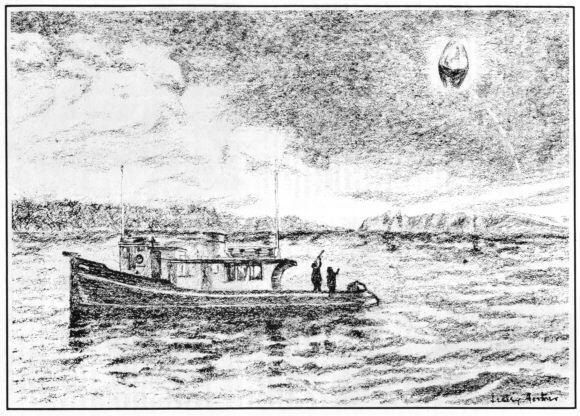 Since the object, travelling south at the time, was staying close to shore, it appears the Halletts' sighting preceded that of the Gillams who saw the light, if it was the same, moving off in the distance. "This was no ordinary aircraft, and it was no plastic-bag trick either," Judge Hallett said. "It was making no sound that we could detect, it was moving very slowly and it was enormous. I'm quite sure no one could play a trick with such a large apparatus without being spotted. We watched it for about five minutes until it seemed to disappear into the clouds." Then right on the waterfront we talked to the Drummond family who for once and all eliminated any idea the incident was a prank or a normal flying occurrence. 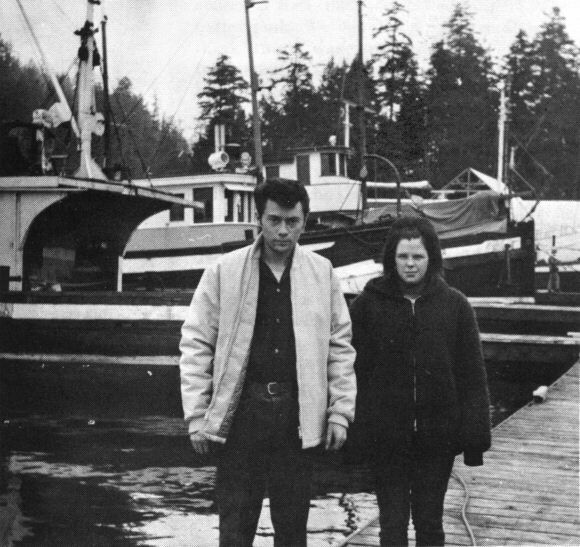 Their startling experience occurred while Jim Drummond, a shipwright, and his wife, Dianna, aboard the tugboat which they have converted into a comfortable home, were making a New Year's visit to Jim's mother who has a house immediately overlooking the shore at Mill Bay. It was she who had the first hint of what was to happen. "It was about seven o'clock and Jim and Dianna were still on the boat, anchored close to shore, when I went outside to call them in to dinner," she said. "Then I noticed a light in the sky moving over the bay. I couldn't tell how big it was, it was so bright, and it had a yellow-orangey glow like sunlight. "I got so excited I yelled to my son to look. I ran out to the other side of my house but I couldn't see over the trees. I tried to phone some of the neighbors but I couldn't get through on the party line." But on deck Jim had received the message. "I looked up and saw this light coming in from the north, just about in line with our boat. It was skimming right under the overcast which was about 900 feet. I ran into the cabin and grabbed my telescope and camera, and my wife came out with me to look. We were really excited." Guessing that on film the object would merely look like a blob against a black background, Jim did not bother with the camera but studied the thing carefully through his telescope. "It was sort of egg-shaped, in a vertical position, but the top and bottom were indistinct," he said. "It seemed to be transparent on top, and inside it I thought I could see a set of lights but I couldn't really make out any details." To make it easier for her son to bring his wife and little boy ashore, Mrs. Drummond had switched on a flood light on the porch of her house. Whether this had anything to do with what followed is impossible to say, but for some reason the object dropped about 300 feet as it passed between the house and the tugboat. It was almost as if it was curious about the strong light shining from the dark shore. Then something happened that on Jim made the sharpest impression of all. "Just at that point something came out of that thing which by then had slowed down almost to a stop," he said. "It was a ray of light like a very thin neon tube, and it was in pieces, something like the dots and dashes of morse code. It came down in a curve and then it flashed right out, all of it at the same time. My hair just stood up on end. I couldn't imagine anything like it." As Drummonds watched a ray like "thin neon tube" divided into pieces flashed from object. Jim, looking through telescope, felt his hair stand on end. After this weird performance the object climbed back to its former height and passed out of sight to the south. It was at this stage that the Halletts might have seen it, their house being in that direction. Significantly the wind was blowing from the southwest at the time. If the object had been a balloon this would have driven it in the opposite direction. Like other people in the Maple Bay area near Duncan where he normally keeps his boat, Jim Drummond a few days later had another sighting. But this time it was obviously some part of a game that pranksters had started to play, perhaps stimulated by the UFO publicity which by then had swarmed into the local press. "The second one wasn't the same thing at all," he said. "You could see it was a kids' job, not a fraction as bright, and it was just bobbing around without really going anywhere." Seen in front of tugboat which they have converted into comfortable home, Jim and Dianna Drummond were treated to spectacular New Year's display when giant UFO flew close to vessel. Jim's mother, whom they were visiting, was first to sight object. The rash of reports that cropped up for the next month or so made it difficult to distinguish between what might be real and what was clearly fake. Eventually we decided that, in our book at least, only the Jan. 1 sightings had the true flavor of authenticity. Yet there were others that made us pause. Phoning James Quaife, the mayor of Duncan, on a tip, we learned that one night in January, he and his wife and several neighbors, watched a light many times brighter than a star perform spectacular manoeuvres in the sky, including dead stops and reversal of direction. A month later after the excitement seemed to have died, John Vanderhoek, who lives on a farm by the Vancouver Island highway, phoned to say that motorists were crowding up in front of his place to watch a "red thing in the air" that was putting on quite a performance. He described it as rising and falling, and changing in intensity as it did so. Above the reddish light there appeared to be a white one, and the object was in motion despite a complete absence of wind. As he spoke the light moved toward mountains to the west and disappeared. That apparently marked the end of the Vancouver Island flap, at least for the time being. But it might be well to explain that the Jan. 1 sightings did not really mark the beginning. In December there had been a scattering of sightings north of Duncan, and in one case the object sounded very similar to that reported by Vanderhoek. It was glowing white on top and red on the bottom. But the most striking of these earlier incidents occurred one morning above Duncan's Alexander elementary school. The object in this case was ring-shaped and, as it moved silently overhead, was observed by a teacher, two aides, the school secretary and two students. "The ring definitely looked as if it was made of some solid substance," Mrs. Edith Beiling, one of the aides, told us. "It was like a very large heavy hula hoop and the material looked like thick rolled-up plastic. It seemed to change in size slightly, perhaps because it was moving up and down, and we didn't have any real idea what size it was but I'd say a large plane could have fitted into it about 15 times. "We saw it through a window from inside the school at first, then we rushed outside to get a better look. We were all pretty excited, and I think there was one who was even quite frightened. I felt like ringing the school bell but decided I had better not." Mrs. Beiling explained the day was heavily overcast at the time and consequently it was difficult to say whether they were staring through open space in the middle of the craft, or whether the center was made of some material matching the clouds in color. But there was no doubt in the witnesses' minds that they were looking at a solid object, not at a smoke ring. After about three minutes the object was lost from sight. The ring-shaped object is not a newcomer to UFO reports, and there are cases in which it has been proved beyond doubt to be of the smoke variety. But here we have the puzzle of a ring being seen as an introductory feature to a UFO show of classic quality. It is difficult to believe the two events were not in some way associated. But, like so much of the UFO story, we must wait for other similar instances before we can begin to guess what the association might be.